Thrilled. That’s how I felt when our HR Manager told me I was invited to cover the 22nd Anniversary of Anawim. It’s my second time to visit Anawim, the home for abandoned elderly of the Light of Jesus Family (LOJF), but the excitement was still there. Anawim was founded by Bo Sanchez, founder of LOJF. 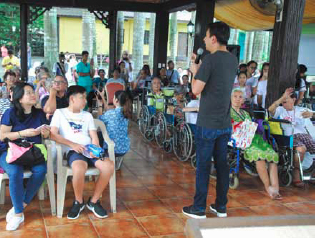 Anawim is a Hebrew word that means “the poor who seek the Lord for deliverance.” Since Anawim’s foundation on June 10, 1995 in Montalban, Rizal, it became a home for our lolos and lolas who have no relatives to support their needs. The Feast Montalban volunteers flashed their beautiful smiles as they welcomed us to Anawim. Afterwards, they led us to the event center for the program proper. We found the lolos and lolas already waiting for us. 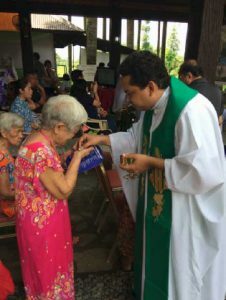 “Thank you.” Bo Sanchez thanked the lolos and lolas, and the Anawim servants for the opportunity to love more.The concelebrated Mass started around 10 a.m. presided by Fr. William Fernandez, CICM, assistant parish priest of San Isidro Church in Rodriguez, Rizal; Fr. Tony Tanchoco, CICM; and Fr. Wilfredo ‘Papz’ Sabarillo, CICM. During his homily, Fr. Tony said, “We are worthy in the eyes of our God.” He emphasized to never lose hope, because even if we’re sick or old, we can still be used by God for His purpose. Hermie Morelos, president of Shepherd’s Voice Publications, gave his opening remarks by thanking all the hardworking staff and generous donors for supporting the foundation. He also encouraged everyone to help more lolos and lolas in the coming years since Anawim can house 150 elders. Today, Anawim has 65 senior residents. Bo Sanchez then said a powerful message in Filipino that made me cry: “Salamat dahil binibigyan niyo kami ng pagkakataon na mahalin kayo.” (Thank you for giving us the opportunity to love you.) He spoke those words with so much love that everyone felt his sincerity. He asked all of us, “Saan nanggagaling ang kaligayahan? Sa kapaligiran ba o sa kalooban?” (Where does joy come from? From the environment or from within?) He explained that our happiness is always an inside job. The joy in Anawim is from the staff, donors, and elders’ sincere love. There’s so much happiness in Anawim not only because it is a beautiful place but because God’s unconditional love for all of us is alive there. After that message, I realized what keeps me excited every time I hear about Anawim. It is more than just a place or a foundation. It is a family where God’s love can be felt. On the 22nd anniversary of Anawim, I had an opportunity to love.